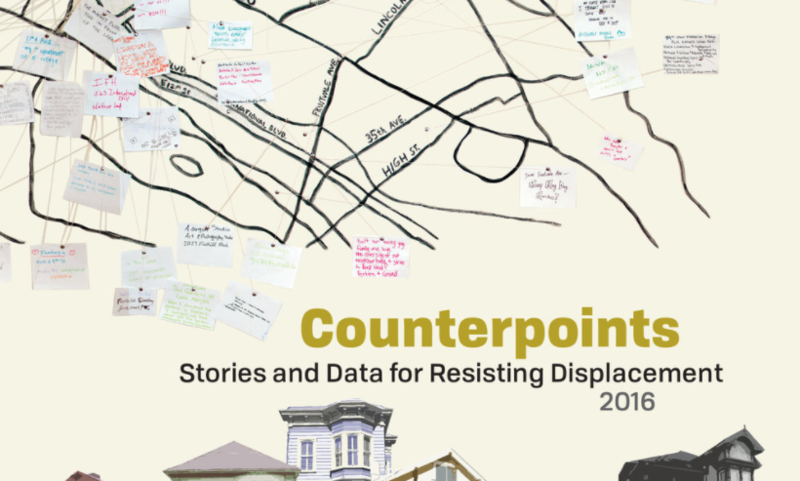 The Anti-Eviction Mapping Project (AEMP) began in 2013 to bring light to the gentrification of San Francisco’s Bay area. AEMP is a data-visualization, data analysis, and storytelling collective, documenting through maps and articles, the disbursement of San Francisco Bay Area residents due to the gentrification of landscapes. Several housing activists searched through data that could be useful for on-the-groundwork to pave the way for lower eviction rates and stand for the people’s right for shelter. They noticed that there was an extreme lack of useful information, from where evictions were happening, to who was being evicted, and who was initiating the evictions. They all knew relatives and friends suffering the drawbacks of houselessness and decided it was important to source the evictors to have a better understanding of what was happening across different cities. What started as a project in San Francisco, has now expanded to Alameda County, Los Angeles County, San Mateo County, and New York City. We spoke with Erin McElroy, co-founder of AEMP, about the project. The first step to this project was and continues to be sourcing data and visualizing the information. They request their data from rent boards and county courts, cross-referencing it with planning departments, assessors databases, and their own crowd-sourced data. They work closely alongside housing clinics in order to analyze their client data; this helps them better understand the demographics of displacement. This can be helpful in targeting where eviction is common and where it could be headed. Visually representing these types of data can be a difficult task, often the most appropriate way to express the information is by displaying the geographical data on maps. AEMP finds visualizing data is an effective way of spreading their message to the public. McElroy explained that, “many people don’t understand the impacts of eviction cumulatively over time, and by showing time-lapse and spatialized data, it helps convey how dramatic displacement struggles are.” Time-lapse conveys which neighborhoods are being hit the hardest, how evictions are correlated with other events, and who is facing threats of eviction the most. Tracking which speculators own multiple buildings and when they evict multiple households forms of lineage of helpful data. This can warn others what their landlord might be planning for their future. AEMP strives to reach an array of people with this information.The artistic visualization aspect of the project helps the public to understand the information in an easier way, which encourages them to help however they can. 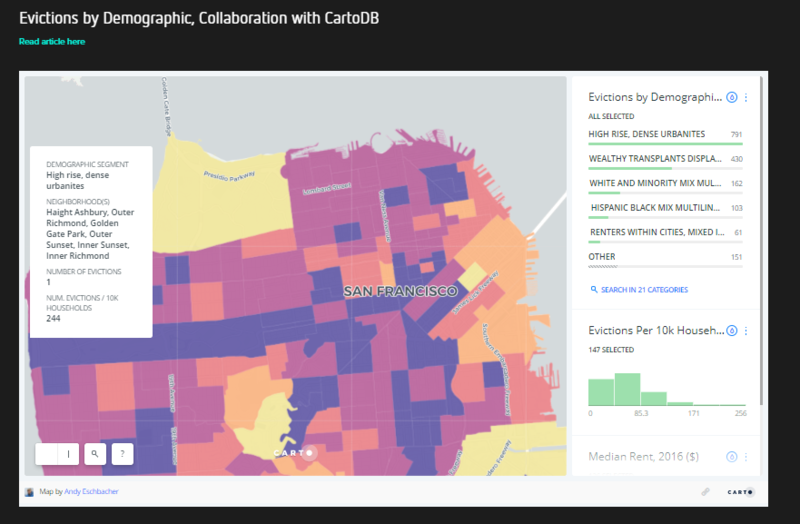 They wish to help local residents struggling with the effects of gentrification, and assist organizations looking for data that will amplify their strategies. One of the projects aims is to highlight the role that real estate speculators, city and state policy, and techno-capitalism (capitalism grounded in technology and science) has played. Many policy groups collaborate with AEMP, often contributing data analysis and map-making skills for their campaigns and policy initiatives. They worked with Tenants Together to provide useful data for their statewide reforms. Understanding geography is specifically important for law makers and policy makers. In addition to starting up their two new branches in Los Angeles and New York City, AEMP has several long term projects in the Bay Area that they are continuing to work on. They have an Atlas book project that they are in the middle of putting together and a subproject called Dislocations to “record Black experiences of gentrification.” They just completed a story map about short term rental agencies in Oakland which contribute to the rise of houselessness and the loss of Single Room Occupancy housing. AEMP is also crafting a new video collaboration with several of their community partners for different campaigns. If anyone is interested in helping the Anti-Eviction Mapping Project, they can contact them on their website. They are looking for map-makers for their Atlas project, including two new cartographers and data visualization experts who are looking to lend a helping hand.